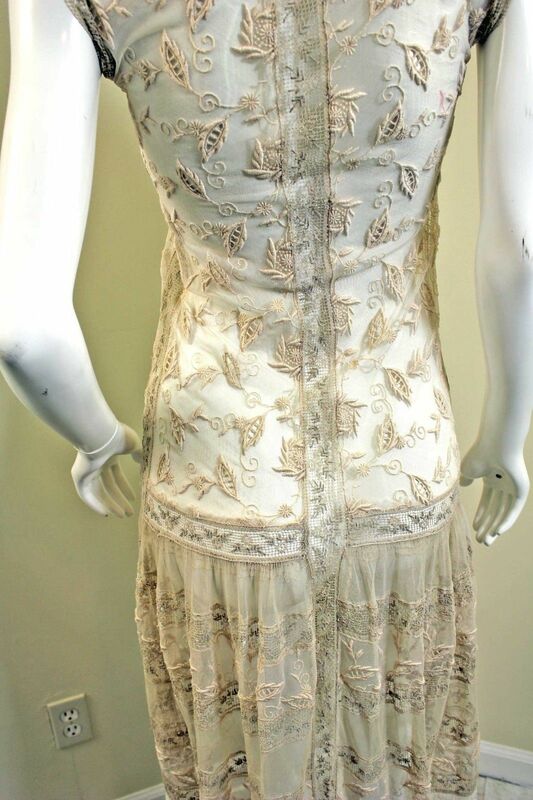 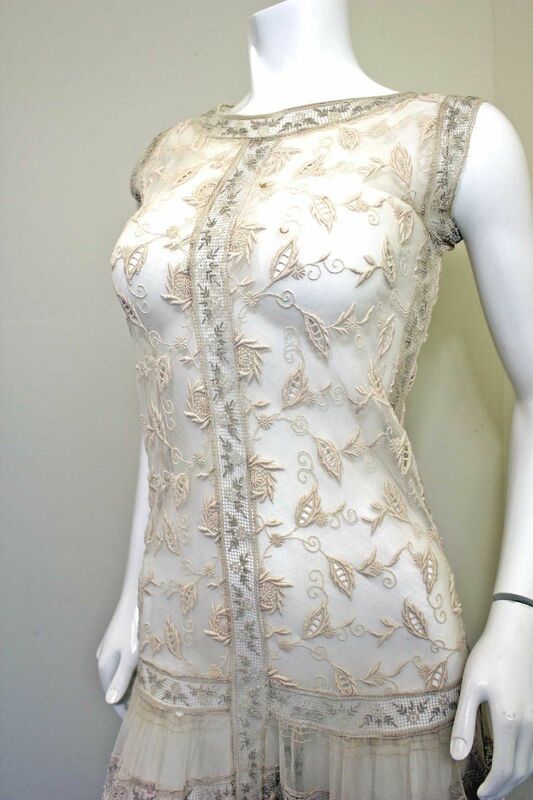 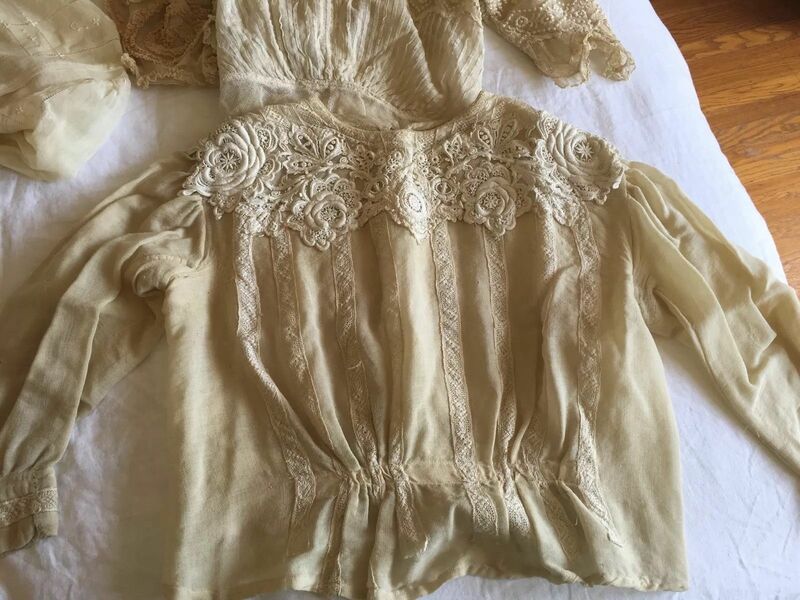 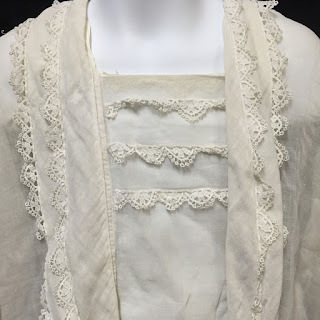 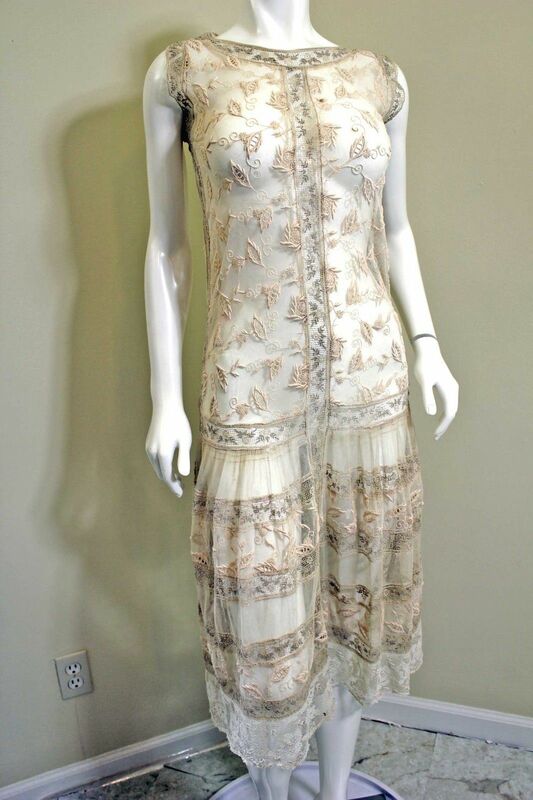 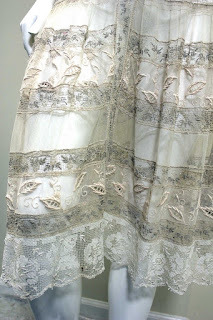 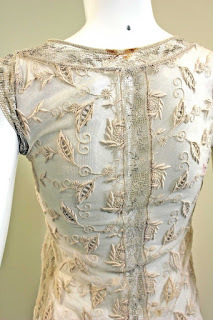 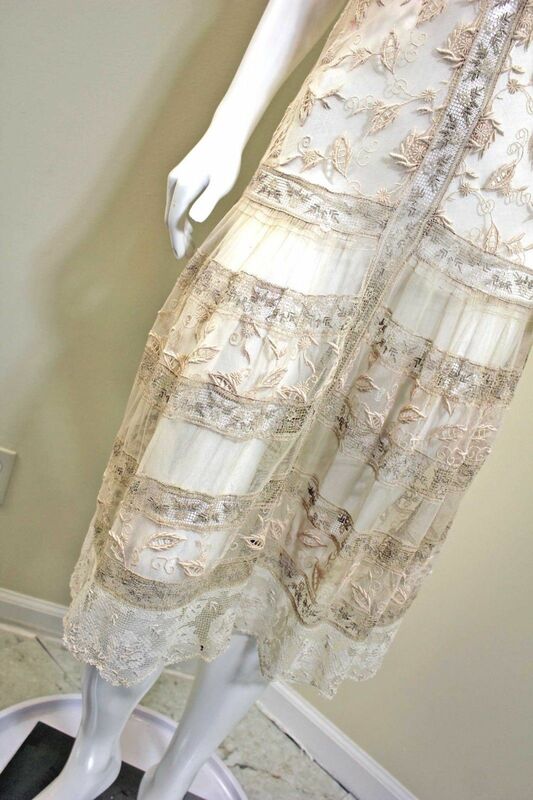 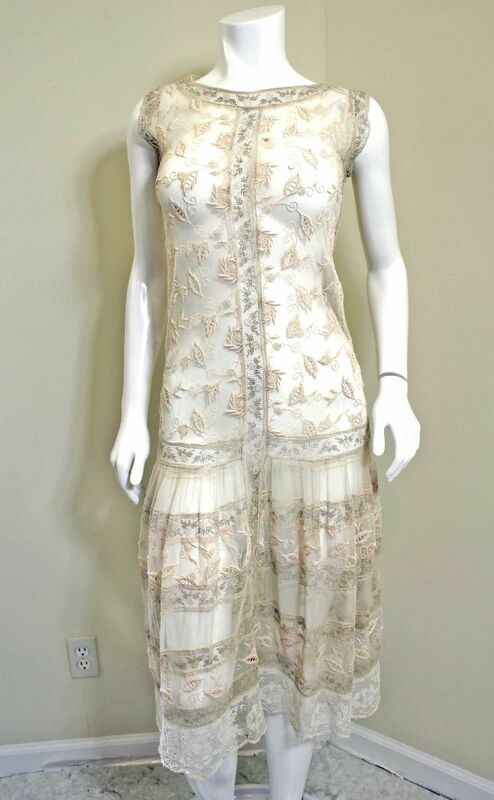 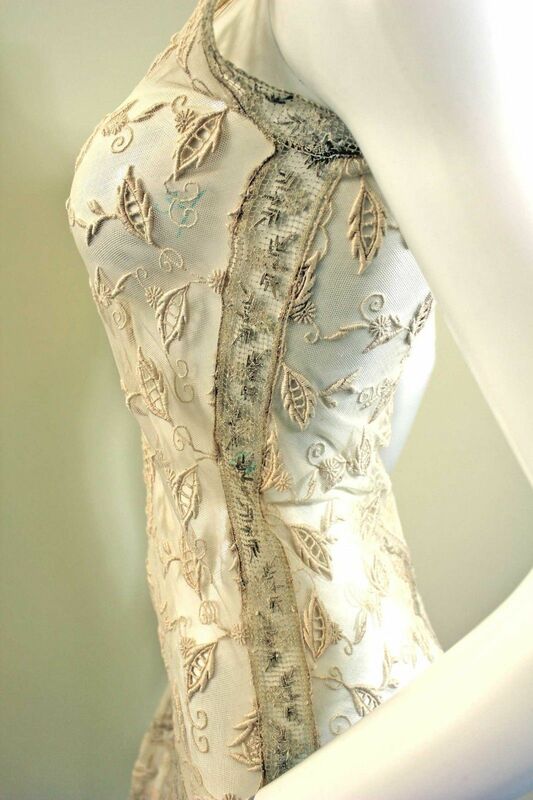 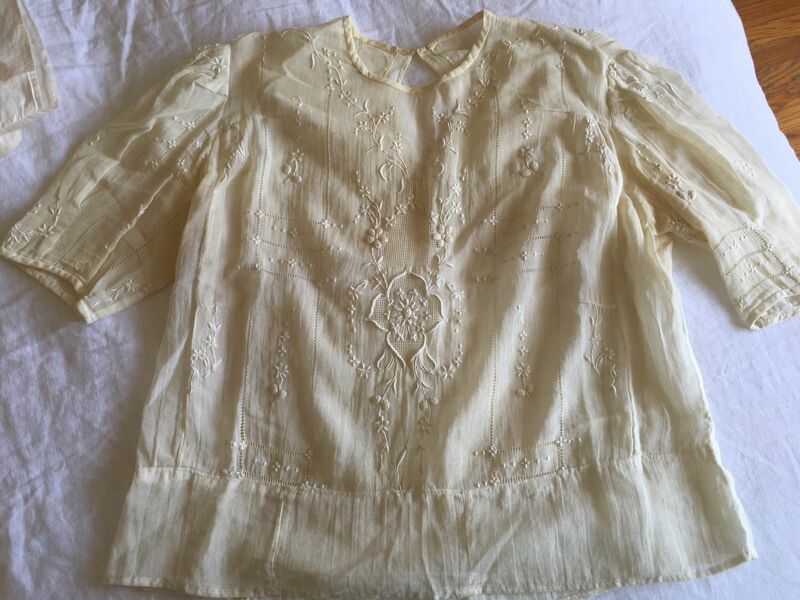 Charming fine linen and machine filet lace tea gown dating to the early 20thc. 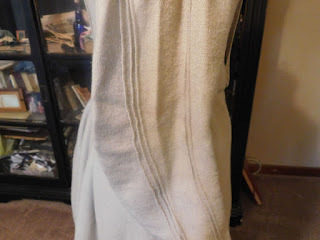 Back hook and eye on the angle and then down one side. 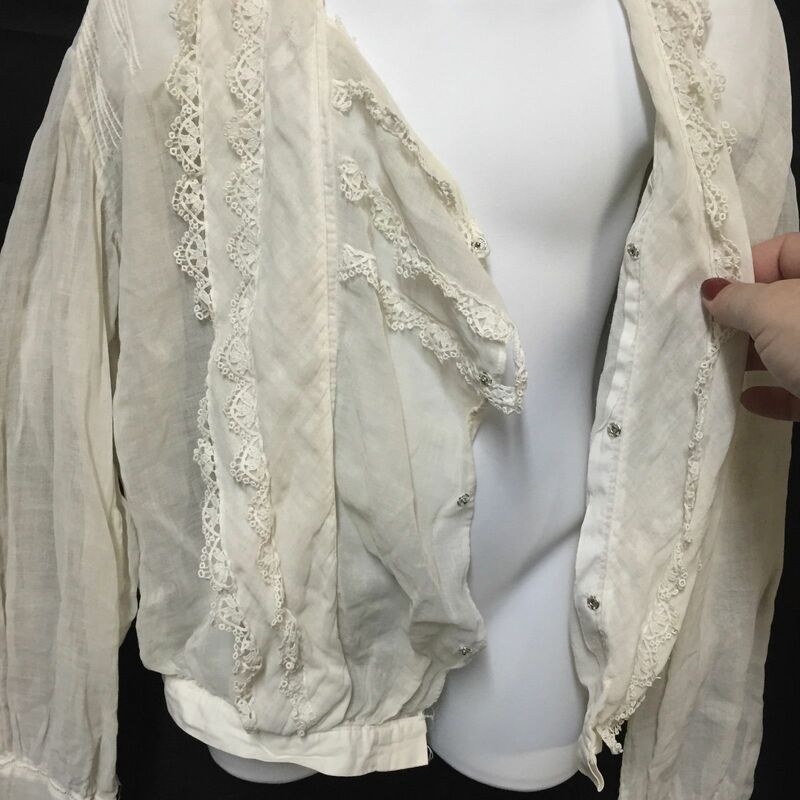 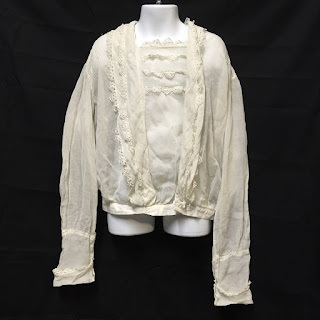 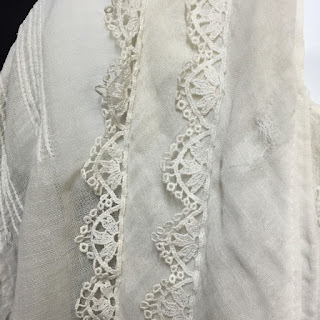 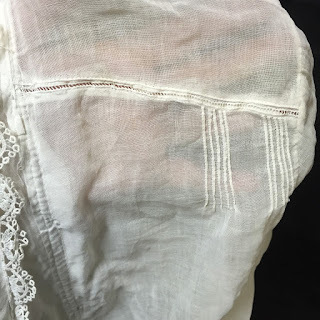 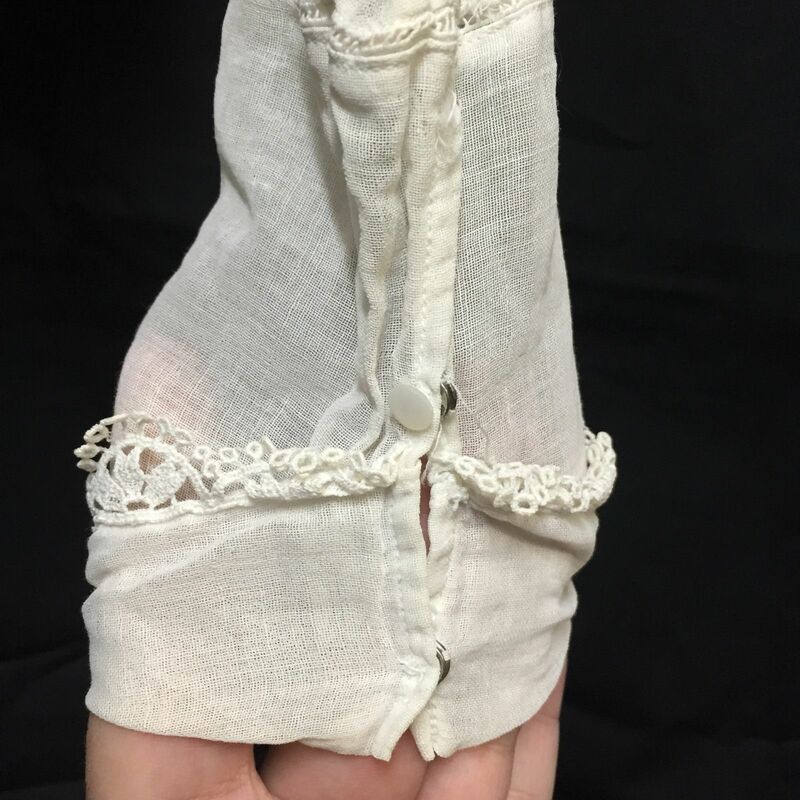 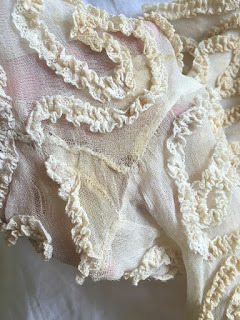 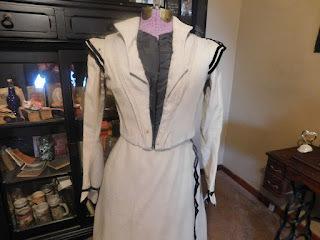 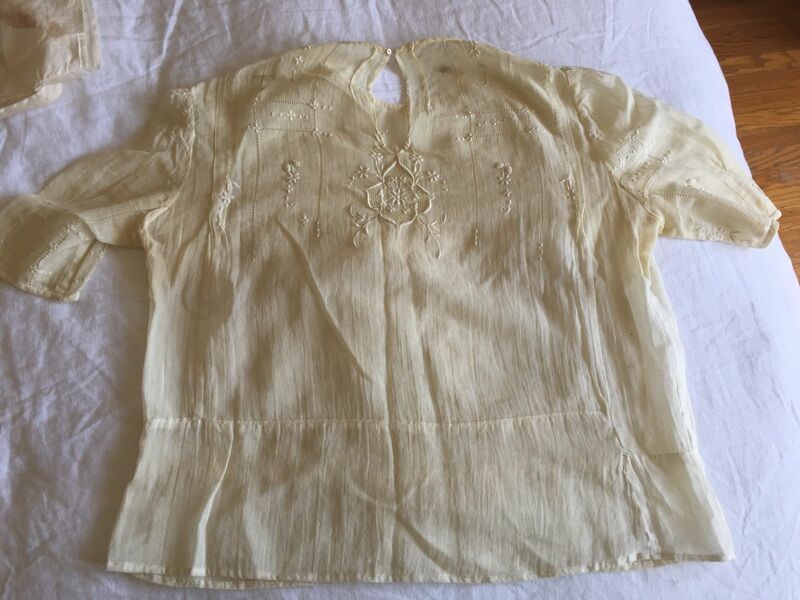 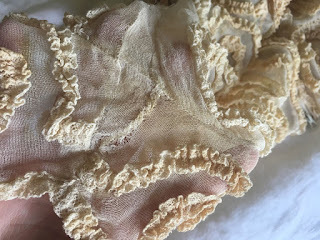 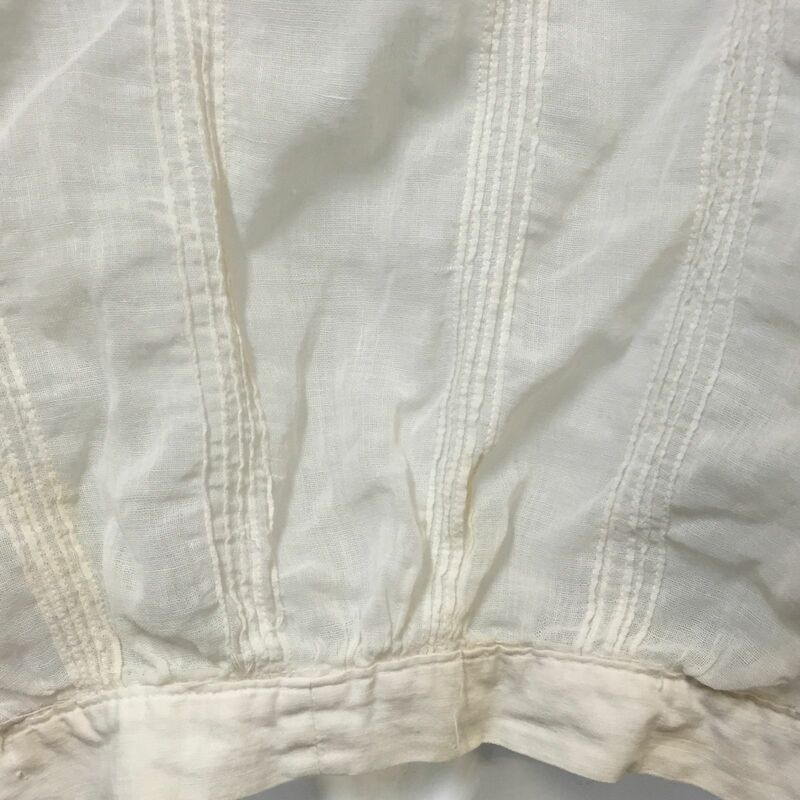 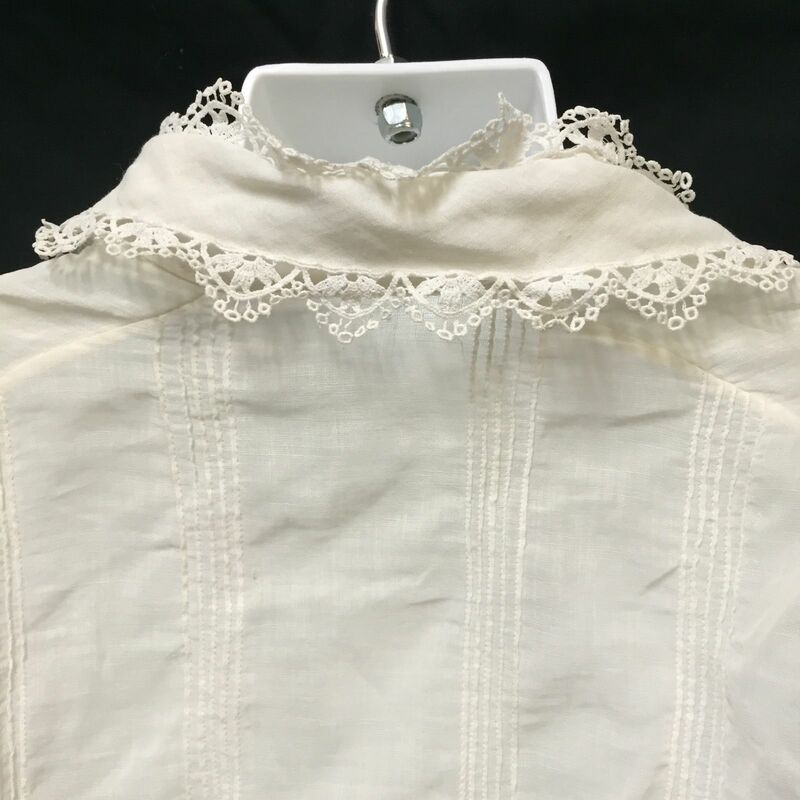 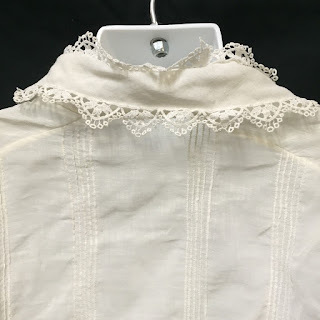 With pintucks and alternating bands of the linen and the lace. In excellent wearable antique condition. 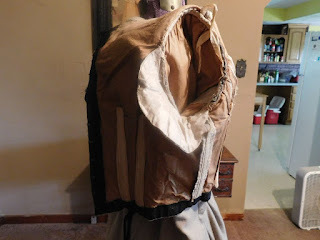 Chest 34", waist 24" sleeves 16", length 55". 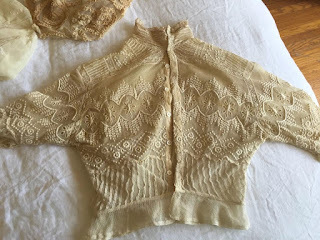 I've decided to part with my oldest, proudest collection. It is truly the end of an era. 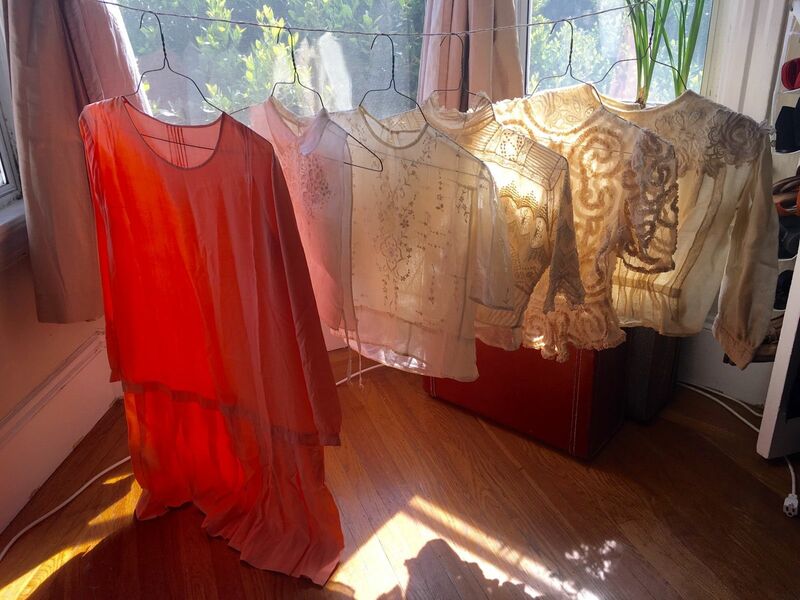 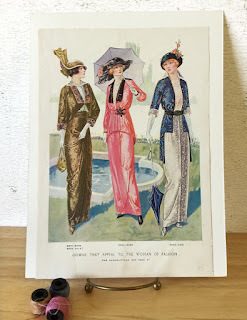 The Orange Dress is most likely 1920's but it's hard to tell based on the one image. The short sleeved blouse with the delicate embroidery is Teen's Era. 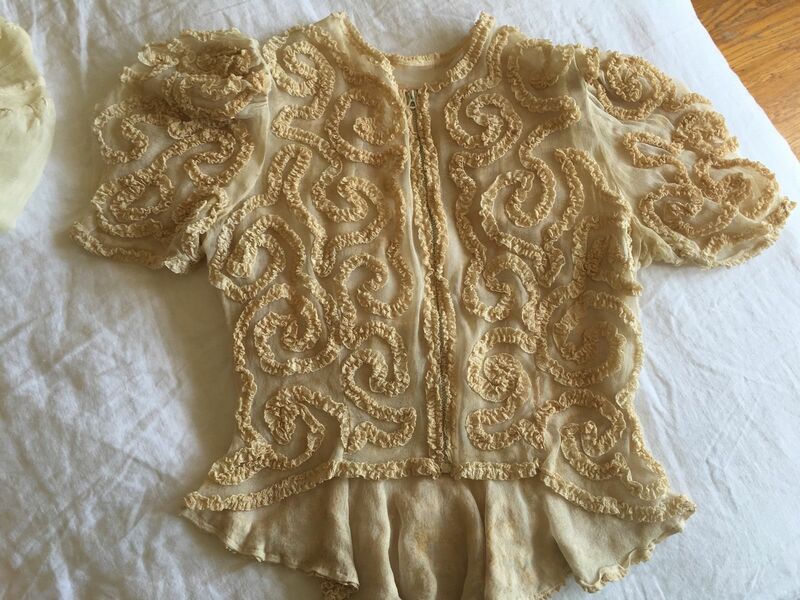 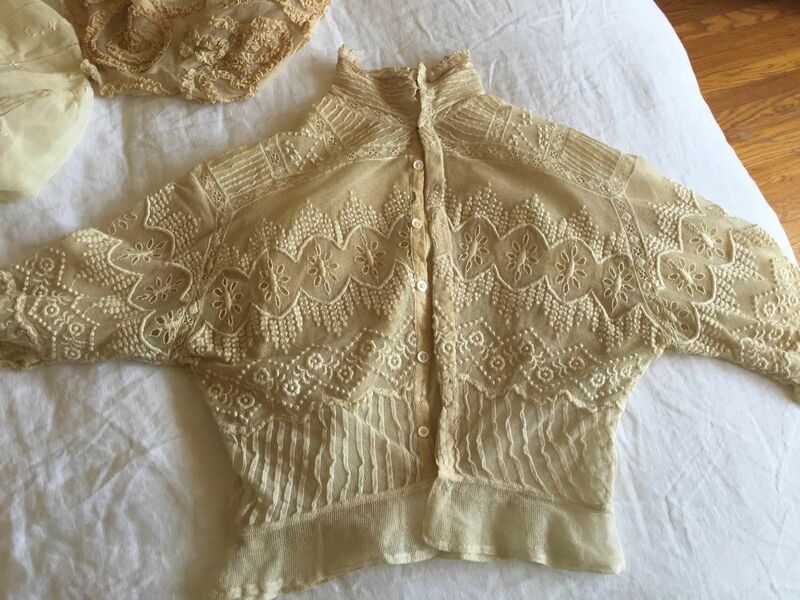 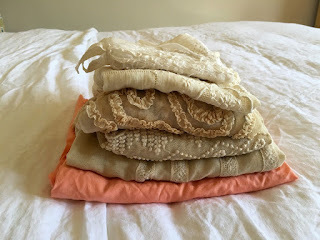 The swirly lace covered jacket is so very 1930's. 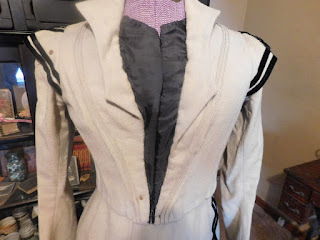 That peplum plus the sleeves scream 1930's. 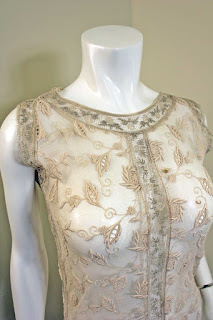 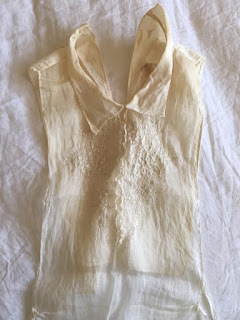 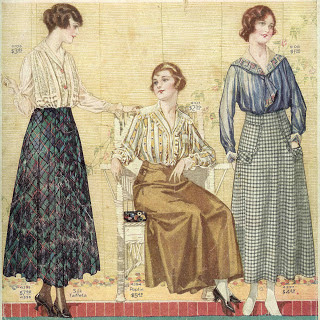 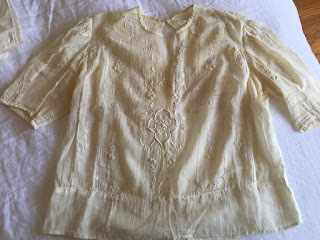 The pigeon front blouse is, of course, Edwardian as is the lace collar one. 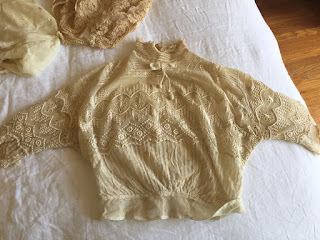 The dickey is from the Teen's Era. Alright folks!! 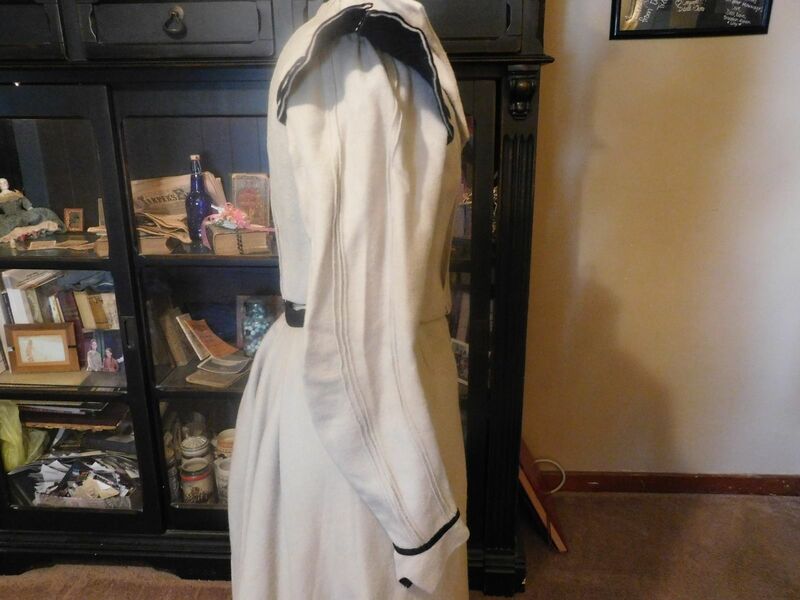 This is the real deal here! Not a reproduction!!! This is 100% wool material with velvet trim. 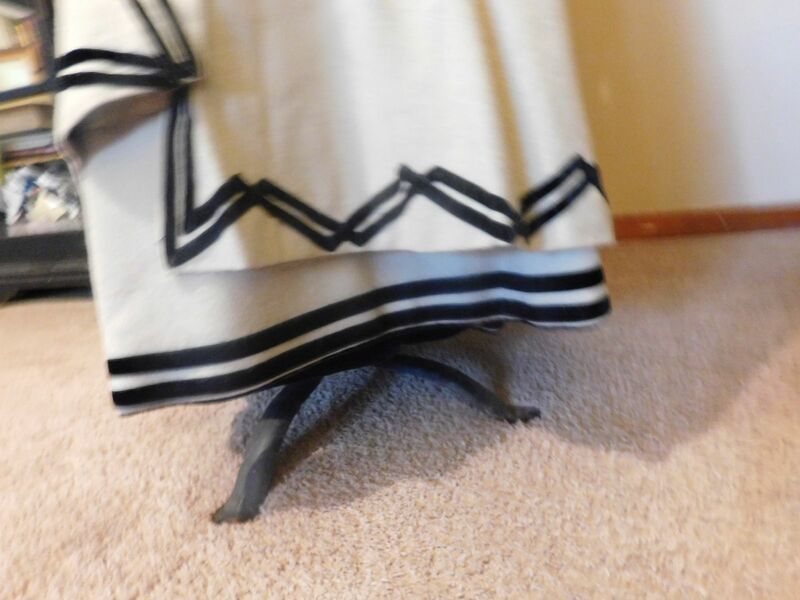 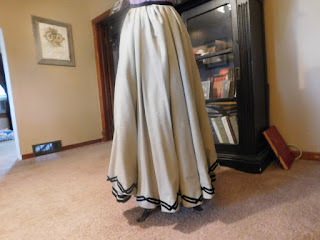 The skirt is 2 piece, with the underskirt made out of a crape type material. 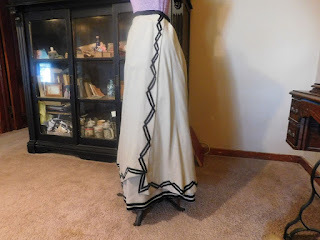 The waist band of the underskirt was not complete when I bought it, so I added a elastic waist band in the waist material. 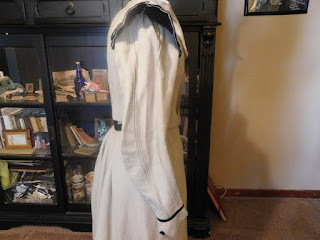 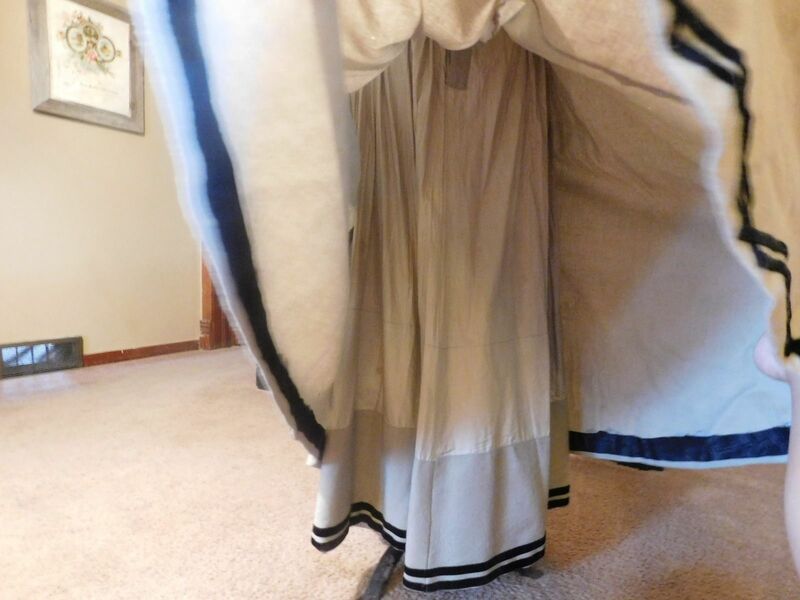 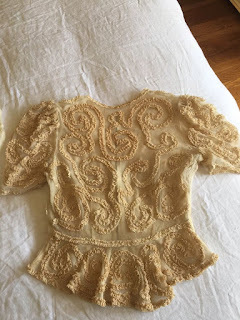 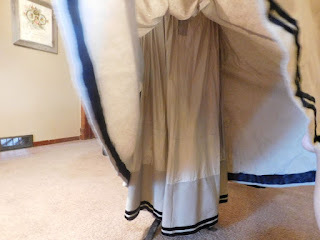 The top is also period, with boned front, pleated sides, sweat pads in the arm pits and all hook and eyes. 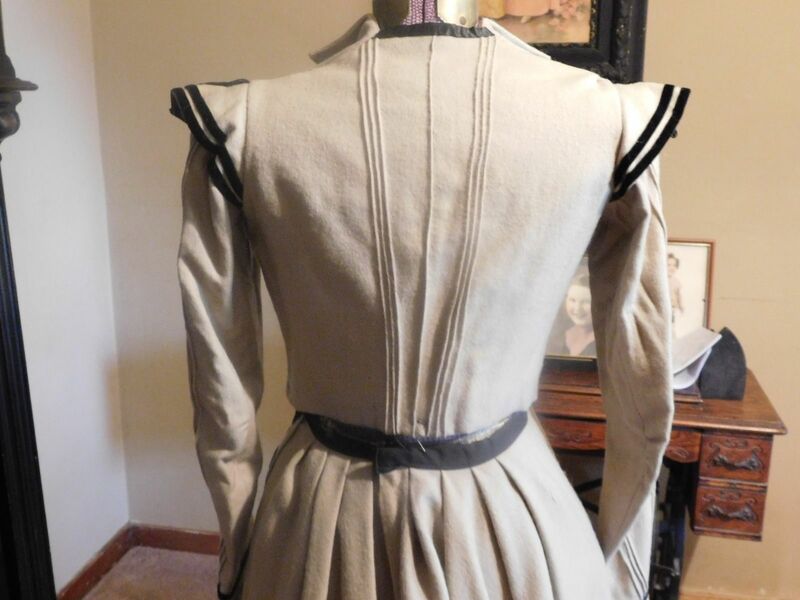 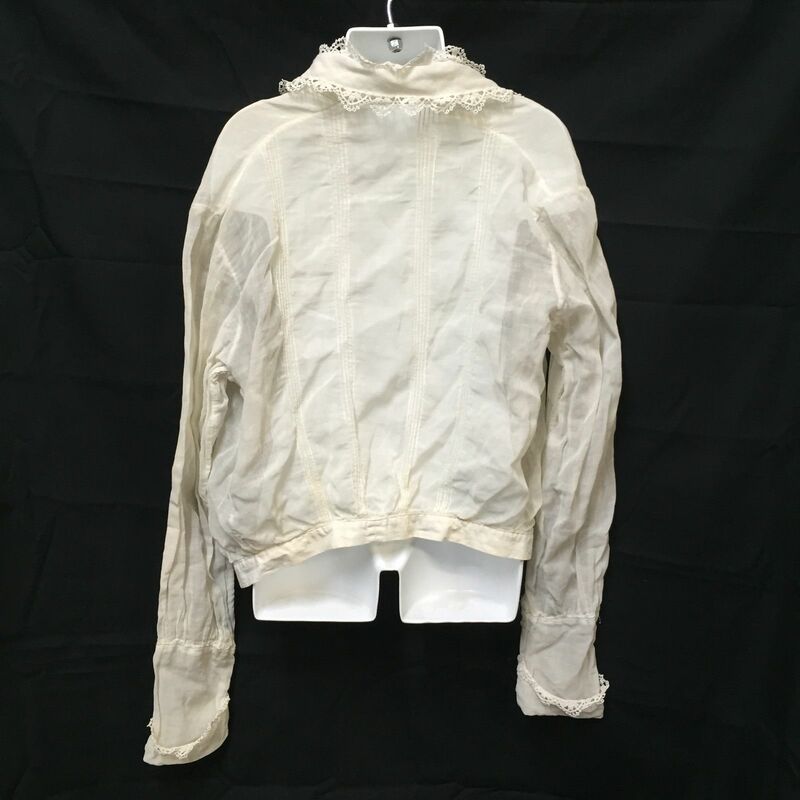 This is a wearable size people, just keep in mind it is over a hundred years old. 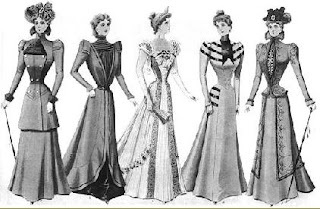 Bust would be about a 32 or 34. 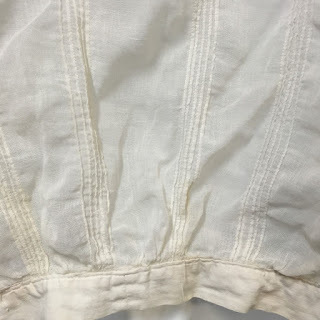 Waist is about a 26-28. 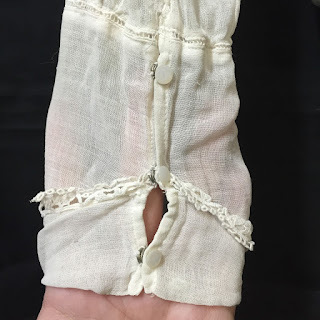 Lenght is 40. Would fit a modern size 6. The material is not frail as of yet, but will not stand alot of straining at the seams to tear them out so be careful if you try to wear it. 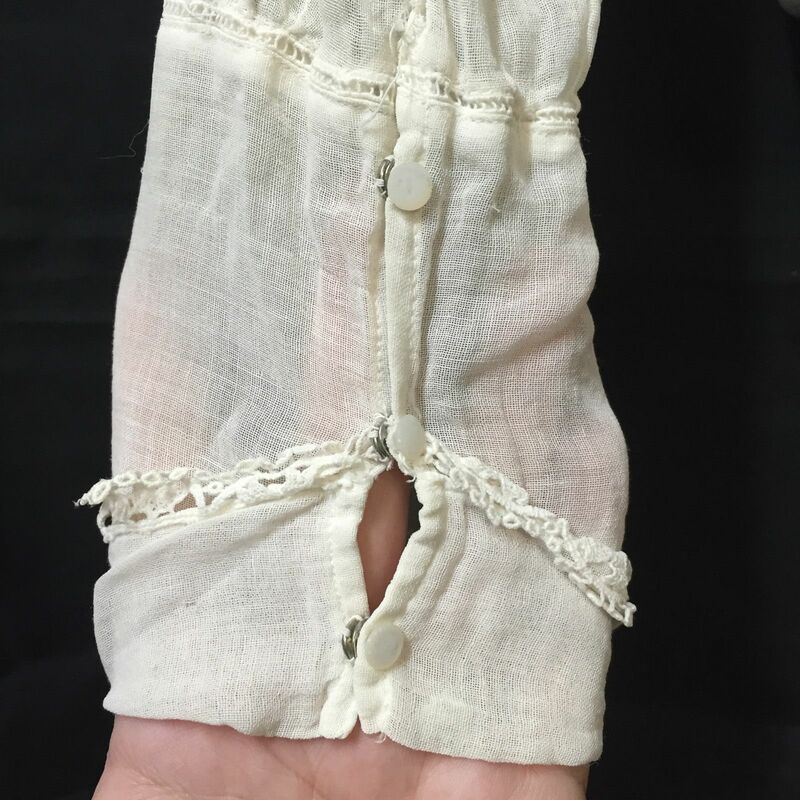 Remember, that's a modern size 6 without a corset. 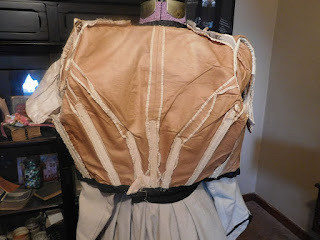 With a corset, it's more of a modern size 8 or so. This is Turn of the Century - most likely 1898/1899.